Greensboro, North Carolina, is that true American anomaly – a place where there seem to be more people writing serious books than reading them. Pick your flavor – literary fiction, poetry, history, biography, memoir, true crime, sci fi and fantasy, young adult, chick lit, historical fiction, literary and music criticism – and you’ll find serious practitioners toiling quietly, often unaware of each other, in this sleepy city with a population of 225,000, five colleges, just a handful of surviving independent bookstores, and no formal literary scene to speak of. As with so many things in the South, you need to understand a bit of history before you can begin to understand how this curious state of affairs came to be. Greensboro’s literary DNA winds back to the Civil War, when William Sydney Porter was born here in the summer of 1862. After doing three years in a federal penitentiary for embezzlement, Porter relocated to New York City and began churning out short stories under the pen name O. Henry. Though he is still read today for his clever plots and twist endings, the man suffered no illusions that he was producing high art. Writing, he once said, “is my way of getting money to pay room rent, to buy food and clothes and pilsener. I write for no other reason or purpose.” Admirably clear-eyed, but he should have gone a bit easier on the pilsener. He died of cirrhosis at the age of 47. Today his name graces a prestigious short story prize and the plushest hotel in his hometown. Jump forward to the 1930s, when the esteemed poet and critic John Crowe Ransom, a member of the literary Fugitives at Vanderbilt University in Nashville, came to Greensboro to teach a summer session at what was then called the Woman’s College of the University of North Carolina. A number of Ransom’s colleagues and star pupils from Vanderbilt eventually made their way to Greensboro to teach, write and hang out, among them Allen Tate and his wife Caroline Gordon, Randall Jarrell, Robert Lowell, Peter Taylor and Robert Penn Warren. Only Jarrell stuck for the long haul, joining the Woman’s College English faculty in 1947 and staying on it, off and on, until he was fatally struck by a car near Chapel Hill in 1965. To this day, no one knows for sure if his death was an accident or a suicide. Frady’s words resonated with me when I first read them 30 years ago and they still resonate with me today. The reason, no doubt, is that when I wrote my two published novels I happened to be working as just another newspaperman in Greensboro, and the place left me alone wonderfully to do my “real” writing when I wasn’t working my day job. It was, as Jarrell had learned half a century before me, a dream set-up for a writer. The year Jarrell died, as it happened, the creative writing program began offering a Master of Fine Arts degree at newly renamed UNC-Greensboro, now a co-ed school. The small faculty was headed by the poet Robert Watson, the short story master Peter Taylor, and Fred Chappell, prolific writer of poetry, fiction and criticism who would become the state’s poet laureate and a renowned nurturer of young talent. Chappell, now 75, is retired from teaching but he’s still writing and still living on a shady street a few blocks from campus. So he stayed in Greensboro, working on stories and a novel, doing home repair jobs, eventually landing a gig teaching creative writing at nearby Elon University in Burlington. Eventually he started placing stories in literary journals, and in the fall of 2008 an agent signed him up. Six weeks later Viking bought his novel at auction. Perry is now married to Tita Ramirez, a fellow student at UNCG, and they have a 3-month old son, Tomas. Candace Flynt, a Greensboro native and early graduate of the MFA program, still lives in town, writing fiction and memoirs. And then there’s a whole flock of writers who have nothing to do with the MFA program. Parke Puterbaugh, who is now enjoying a major success with his book Phish: The Biography, about the popular jam band, said, “If you’re sufficiently motivated and self-directed, Greensboro’s a nice mid-sized city with decent bars, restaurants and culture – but not an overwhelming mix of things to swamp your concentration.” Bill Trotter is the wildly prolific and versatile author of histories, biographies, novels, reviews, essays and, for good measure, columns about computer games. His philosophy: “Adopt a blue-collar attitude and write for whatever and whoever will pay you for your time, sweat and expertise.” Mark Mathabane was teaching at N.C. A&T State University when his memoir about growing up in South Africa, Kaffir Boy, became an international best-seller. Jerry Bledsoe was working as the local newspaper columnist when he wrote a true-crime book called Bitter Blood that became a #1 New York Times best-seller. The late Burke Davis lived here while writing many of his more than 50 published works of history, fiction and biography. Robert Watson still lives here, as do the accomplished writers Marianne Gingher, Lee Zacharias, Michael Gaspeny and too many others to name. Orson Scott Card, two-time winner of both the Hugo and Nebula awards and best known for Ender’s Game, is perhaps Greensboro’s one brand-name author. He’s also a prolific contributor to a local free weekly newspaper called The Rhino Times, in which he writes copious, cranky musings on everything from current politics to cookies, squirrels, movies and global warming. Today Greensboro itself is something of a Sleeping Beauty, less a true city than a well groomed but slightly overgrown town. It is a thoroughly middling place, blessed with mild winters, governed by aggressively moderate leaders, populated by citizens whose civic pride and self-satisfaction can sometimes shade toward smugness. The town is located squarely in the center of the state’s rolling Piedmont, midway between the Blue Ridge Mountains and the Atlantic beaches, a place so at-home in its own skin that it never developed the big-league pretensions of Raleigh to the east or Charlotte to the west. It’s content with its new minor-league ballpark and downtown public library, its respectable symphony orchestra, its one renowned art museum. Most of the state’s bold-face writers live or teach in the Triangle, including Reynolds Price, the novelist Lee Smith and her essayist husband Hal Crowther, Jill McCorkle, Kaye Gibbons and many others. It was there, in the writer’s mecca of Hillsborough, that the late Pulitzer Prize-winning cartoonist Doug Marlette dared to publish a novel in 2002 that lampooned his neighbor, the writer Allan Gurganus. The ensuing literary cat fight – there were charges of everything from elitism to homophobia, the two unpardonable sins of our age – merited several buckets of ink from the Raleigh News & Observer. Such hot-house foolishness would be unthinkable in lukewarm, mannerly Greensboro. Torpor is a funny thing. While most people find it stifling, many writers find it alluring, even necessary. The cliche of the writer toiling in his remote shack, much like the reality of Philip Roth toiling in his remote New England retreat, are two equally valid illustrations of the writing life’s solitary nature. And Greensboro’s genial brand of torpor goes a long way toward explaining the place’s allure to writers – both to the young ones who keep coming here to launch their careers, and to the established ones who work here, quietly, often apart, usually alone. There’s a sense here that if your writing is not always avidly read by your neighbors, at least its making is regarded with genuine respect by them. Al Brilliant, owner of one of the town’s few surviving independent bookstores, expressed this perfectly: “People treat writers as workers here.” Not as special aesthetic creatures, not as eccentrics or pariahs or freaks, but as people who work hard to make worthwhile things. That’s an intangible but vital thing for any writer to feel, and I’ve lived in dozens of places in America where it was utterly absent, and sorely missed. It certainly doesn’t hurt that in a country of flowering creative writing programs, UNCG’s is consistently ranked among the top 25 by Poets & Writers magazine. While this is not the place to debate the merits of such programs – are they incubating genuine talent, or are they spawning a torrent of technically accomplished books that are devoid of felt life? 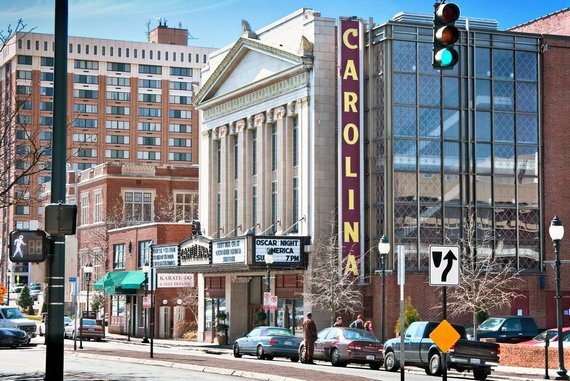 – there is no doubt that the UNCG program’s rich history and its continuing reputation for quality are a spring that keeps replenishing the city’s literary life. To most people, that probably sounds like a working definition of colossal torpor. To a writer, it sounds like heaven. My friend Morry and I reached Nathan Phillips Square after sunset, long after several hundred had scattered themselves in front of Toronto’s City Hall. Somewhere among the curious and cold was Daniel Lanois. We could hear him; we could even see him projected in a dozen different places – on screens where no screens had been before, even in the reflecting pool. There was no obvious stage, but eventually we found a ramp leading up to a platform on which a few dozen had congregated. They were peering down into a pit. We did the same – and there he was, at the controls of an audio-video installation. And there he would remain until sunrise. And half the fun was finding him. Lanois’ all-nighter was one of the hyped attractions of this year’s Nuit Blanche, an all-night free art festival held in early October at dozens of venues in and around downtown Toronto. Over the course of five years, my feelings have swung from amazement to irritation and back again. I’ve been bemused and bored. I’ve been caught up in curious crowds, and I’ve loathed the drunken hordes. The first year was a delight. I knew nothing about Nuit Blanche. There had been some chatter about it, but it was largely word-of-mouth that drew a few hundred thousand night-owls into the streets – looking to be inspired. The high point for me was an outdoor fog installation in a leafy stretch of the University of Toronto, where I and dozens of others walked – sightless – on a meandering path drenched in fog. All other senses were heightened – the bumps of the earth beneath us, the sounds of chatter around us. Behind me, a guy telling everyone within earshot how the mushrooms he’d taken were just then kicking in. I’ve never managed to last beyond three in the morning, and in the second year, the high point came at about 2 a.m. Exhausted, my friends and I ducked into the Music Faculty of the university, plunked ourselves down in the auditorium, and were treated to the quiet and cool sounds of a live jazz ensemble. The following year, in front of an old downtown building known for its galleries and studio space, a small crowd had gathered for a guided tour of the building. We joined. Ten minutes into the tour, it dawned on me that this was no ordinary tour. We were, in fact, part of a performance piece – the tour guide a performance artist leading us, her audience, up and down staircases, into hidden rooms, basements and rooftop gardens. Like a general leading troops into battle, she marched on, regaling us with stories. I would have followed her anywhere. Last year should have been the best. I knew the city inside out. I knew which areas promised inspiration. I had visiting guests and was anxious to show off the city. But the crowds from previous years had suddenly mutated into hordes. And where the leafy university area and fascinatingly dodgy outer edges of downtown had been the focus of the earlier years, now the downtown commercial strip and the financial district had suddenly become the focal point. And we were swept up, and let down, by the masses. This year was a targeted approach. One glance at the throngs on Yonge Street, and we made for the infinitely more interesting strains of Daniel Lanois at City Hall. Curious crowds over partying hordes. Then it was on to the newly-opened film centre, Toronto’s year-round cinematheque. In one small screening room, a handful of us filed past the empty audience seats, to the edge of the stage, where we sat, looking out into the seats. Above the seats, suspended from what appeared to be clotheslines, were sheets of varying sizes and suspended at varying heights. On each, a different looped segment of Fellini’s 8½ played. Apparently curated by Canadian filmmaker Atom Egoyan, Fellini’s fragments were hypnotic. You create your own Nuit Blanche. With so many venues, inside and out, in so many neighbourhoods, you chart your own course. And with a bit of timing and luck, moments of inspiration might just be around the next corner. I’m a Texan, not a Southern, writer, but…no mention in this post of Thomas Wolfe? Wolfe was Asheville. We are just the foothalls. But what an elegant essay Bill Morris wrote about the literary lineage of our little burg (which can also lay claim to Morris himself — his first two novels Motor City and All Souls Day were glorious reads.) Lorraine Ahearn, Greensboro, N.C.
What an enjoyable look at Greensboro’s literary history and why it is such a comfortable place for writers. It takes me back to my five and a half years in the Gate City and makes me thankful for all the talented people I became friendly with there — the essayist included. Looking forward to the next book, Bill. a poet to be treasured and to be spotlighted along wit her husband. Perhaps I missed it, but no mention of Michael Parker or Craig Nova. Both have strong ties to UNCG’s writing program and warrant mention.